The style of the Dunsmuir Botanical Garden rock garden is called a “crevice rock garden”. This style came into use in the 1990’s to denote a type of rock garden in which most of the surface is composed of closely set stone; the plants are inserted when small into the narrow crevices between the rocks. A style originated by Czech growers, crevice rock gardens are designed and built with an emphasis on providing conditions favorable to plants in high alpine zones. Alpine plants are plants whose native habitat is mountain slopes above the tree line approaching the line of perpetual snow. Some climatic factors are beyond control, but the site, shape of the garden, soil conditions, irrigation, and nutrients added can be modified in a crevice rock garden to aid alpine growth. This style de-emphasizes human access to the garden, which is viewed as destructive, much like human intrusion on a natural ecosystem. It is meant to be enjoyed from the periphery. In 2008 when a large double trunked, big leaf maple (Acer macrophyllum) died at the north end of the Meadow and had to be removed, an opportunity presented itself for creating a new feature in the Gardens. The new feature needed to fit the scale of the Gardens and our mission of “enhancing the natural setting of the Dunsmuir City Park for the enjoyment and horticultural education of the public through the establishment and maintenance of native and cultivated woodland plants.” It was decided a rock garden would meet these needs and provide an interesting vehicle for showcasing native alpine and woodland plants endemic to our local mountain ranges. 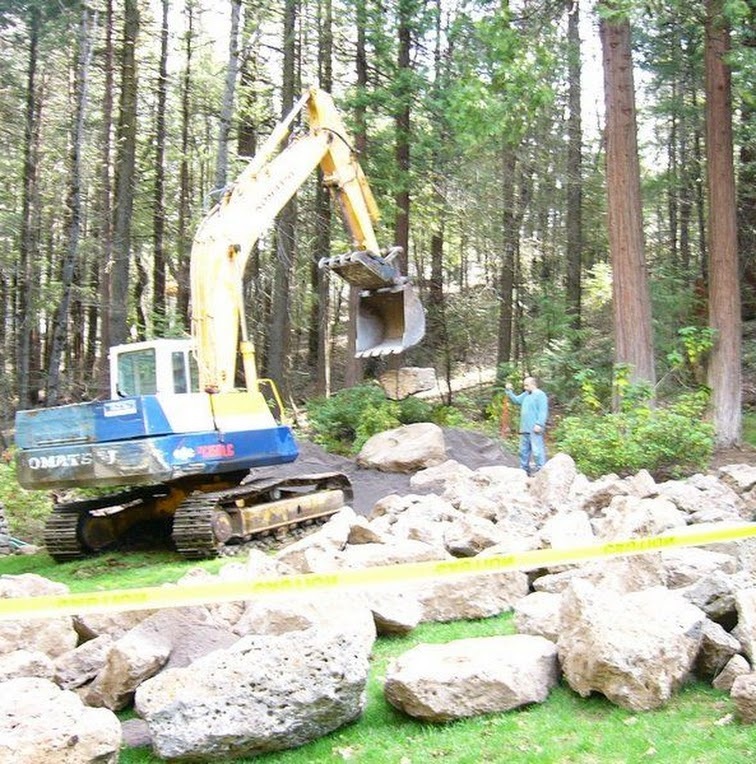 Using grant funds from the Shasta Regional Community Foundation and Union Pacific for the crevice rock garden project, Josef Halda, Czech botanist, plant hunter and rock garden builder, was hired to oversee construction of the rock garden in 2010. Josef originated the crevice rock garden style that offers a combination of drainage and root protection that is well suited to our climate. Josef chose scoria, a basaltic lava rock, from the Montague area in Siskiyou County for the rock garden. Construction began in April and was completed in May 2010. Over 30 tons of rock and over 20 tons of crushed volcanic rock sand were used to construct the garden. In June 2011 after allowing it to over-winter, volunteers planted the crevice rock garden with perennial alpine and woodland plants from the surrounding Klamath, Siskiyou and Cascade mountain ranges. The plants were obtained from nurseries specializing in propagating plants from seeds collected in their native, wild settings. We hope you will visit the crevice rock garden often and experience the joy of seeing the plants grow and change with the seasons.